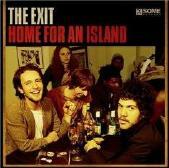 The Exit play elegant punk that harkens back to the early days of U2, The Police, and The Clash. Dreamy at times yet strikingly attentive (especially the rhythm section), "Home for an Island" contains reggae rock vibes with the quiet disobedience of punk stirring about, making the listening experience much more esoteric than, say, a Sublime or 311 record. Making smart, detailed rock is not easy, yet The Exit use good blueprints and execute its blend of dub, rock, and island beats with grace and assertiveness. If you yearn for something headier than another bleached haired punk rock band that sings without conviction, check out The Exit. For more information, check out http://www.theexitrock.com.